TV tuners for your computer are pretty old hat, but ones such as the Hauppauge myTV 2GO, that you can also use on your smartphone or tablet, are a little more new and exciting. Of course, if you have a data allowance from your mobile operator generous enough to stream TV from the internet via 3G, then this might not be of too much interest to you. And if you've already got a USB TV tuner in your PC, again you're not going to be too inspired to part with your money. But for viewing TV on the move, it isn't too bad at all. 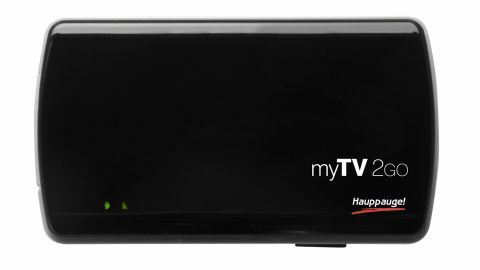 You connect to the Hauppauge myTV 2GO via Wi-Fi, which makes it compatible with iPhones and tablets without USB connections. Or you can connect through USB on PCs. While connected to the Hauppauge myTV 2GO via Wi-Fi you can't get internet from your wireless router. There is a work around for this, but it is rather convoluted and didn't work for us - Hauppauge warns that it is not compatible with all routers. Setting it up is very easy, and although the Hauppauge myTV 2GO can't receive Freeview HD, image quality was very good, especially on the smaller screens of the tablet and smartphone we tested it on. The software available works well, with a built-in programme guide, and ability to record or pause the channel. A battery life of around three and a half hours isn't too bad, but it has a removable battery, so for longer trips you could buy a spare. On the downside, the antennae is rather small, so it only works in areas of strong signals, and there's no ability to connect a larger antennae to it. Overall the Hauppauge myTV 2GO is a good device, but make sure it's what you need before buying it. While the video quality is very good - especially on a smaller screen - you should make sure you can get a strong Freeview signal where you're going to be using it. The application that comes with it works very well with touchscreens and on desktops.